The poll was conducted in 13 states with competitive Senate races this November over a three week period, beginning on June 11 and ending July 2. About 1,000 respondents were surveyed in each state, and the margin of error for the results in each head-to-head Senate race is about 4.5 percent. 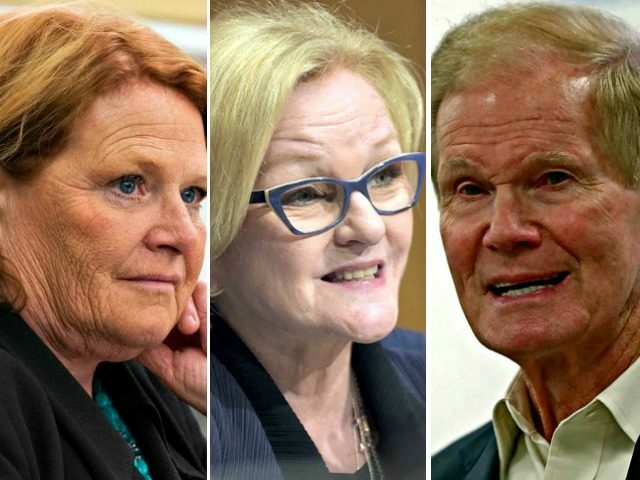 Incumbent Red State Democrat senators in Florida, Indiana, and North Dakota are all losing to their Republican challengers, though the results in all three states are within the margin of error. Axios-Survey Monkey ran a number of scenarios in each of these states based on different turnout models among likely voters, and those results are even more troubling for the three incumbent Democrat Senators. In Florida, Scott holds a three point lead over Nelson in the high Democrat turnout model, with a nine point lead in the high Republican turnout model. In Indiana, Braun holds a one point lead over Nelson in the high Democrat turnout model, and an eight point lead in the high Republican turnout model. Things are even worse for the Democrats in this poll in one of the states where some were hoping for a pickup. In Tennessee, Republican Rep. Marsha Blackburn (R-TN) holds a 14 point lead over Democrat Phil Bredesen among registered voters, a 14 point lead in the high Democrat turnout model, and a 19 point lead in the high Republican turnout model. In Arizona, where Democrats have long expected to pick up the Senate seat currently held by Sen. Jeff Flake (R-AZ) thanks to the candidacy of Rep. Kyrsten Sinema (D-AZ), the Axios-Survey Monkey Poll results are less than encouraging. For months Sinema has held a double digit lead over all three of her potential Republican challengers in most polls – Rep. Martha McSally (R-AZ), Dr. Kelli Ward, and former Maricopa County Sheriff Joe Arpaio. But in the poll released on Tuesday, Sinema leads McSally by only four points among registered voters, 48 percent to 44 percent, though she maintains a double digit lead over Ward and Arpaio. In a high Democrat turnout model, Sinema leads McSally by six points, but in a high Republican turnout model, that lead drops to only one point. When a winner emerges from the Arizona GOP Senate primary on August 28, Republicans across the state are expected to consolidate around the winner for a tough general election battle against Sinema. Several other incumbent Red State Democrat senators are in 2018 races that are very tight. In Missouri, for instance, Sen. Claire McCaskill (D-MO) leads Republican challenger, State Attorney General Josh Hawley, by two points among registered voters, 49 percent to 47 percent. In a high Democrat turnout model, she leads by five points, but in a high Republican turnout model, Hawley leads by five points. The biggest surprise in this poll for Democrats may be in Ohio, where Sen. Sherrod Brown (D-OH) has long held a double digit lead over Republican challenger Rep. Jim Renacci (R-OH) in most polls. But in the Axios-Survey Monkey Poll released on Tuesday, Brown leads Renacci by only eight points among registered voters, 52 percent to 44 percent. In a high Democrat turnout model, he leads by eight points, but in a high Republican turnout model, Renacci leads by one point. Notably, the Axios-Survey Monkey polling ended on July 2, one week before President Trump announced his pick of Judge Brett Kavanaugh for the Supreme Court, and included only five days of respondent polling after Justice Anthony Kennedy announced his retirement from the Court on June 27. The GOP is targeting Democrats up for re-election in states Trump won in 2016 — of which there are 10, not including Sen. Doug Jones, who’s not up for re-election this year but hails from Alabama. The states the RNC is focusing on are Missouri, Montana, North Dakota, Indiana, Ohio, Florida, West Virginia, Wisconsin, Pennsylvania and Michigan. With less than four months to go until election day in November, this latest Axios-Survey Monkey Poll suggests that the momentum may now be shifting towards Republicans and away from Democrats.